This Nativity contains the Holy Family made from polymer clay. 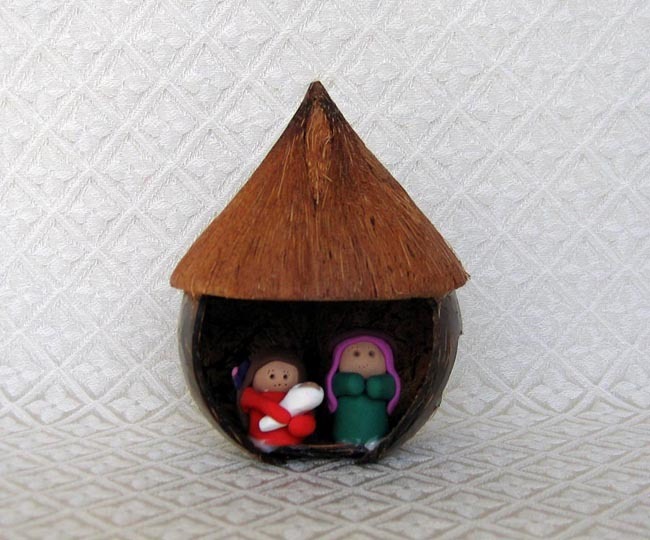 The figures are glued into a stable hut made from a real coconut shell. The clay figures measure 1.5 inches tall. The coconut hut measures 5 inches tall. This scene is made by the Ochoa family in Trujillo, Honduras. The family members are wife Tonia, husband Elias, and daughters Rosa and Desi. They live in a very isolated rural community in eastern Honduras. The family makes these creations together. They collect coconuts from the trees along the beach. After husking the nuts, they remove the coconut meat and eat it! Then Elias cuts circles and other shapes from the shell. They polish the pieces with sandpaper to make them shine. These are hardworking people who have no other way of making a living in Honduras besides selling their crafts. They live in a dirt hut with thatched roof, with no electricity or plumbing. They are able to use a power drill to cut their coconuts at a community store. These are people who have no expendable income, so they can’t fathom how others spend their money or where it comes from.